Courthouse Butte & Cathedral Rock This is the view from the top of our street and across from the high school where all the festivities will be held. 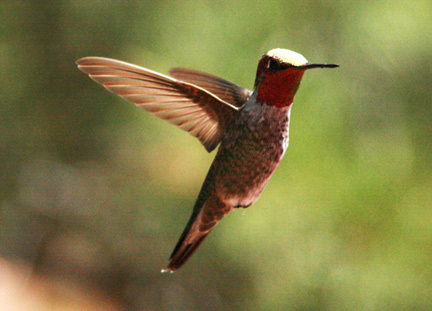 Join us for the Sedona Hummingbird Festival on the first weekend of August. Events and information will be up the hill from our Sedona B&B at the new Performing Arts Center. Everything will be happening just two miles away. Minimum stay for this once in a lifetime experience is 3 nights. 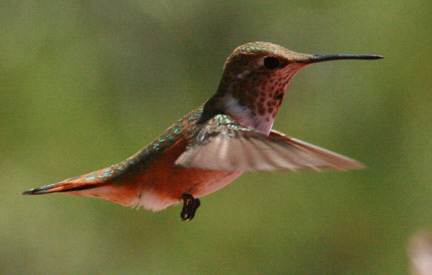 Hummingbirds are very particular about where they sleep and eat. 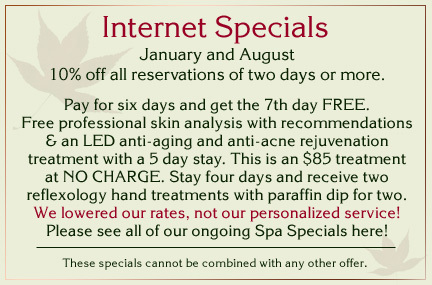 Let them point the way to the most nature friendly lodging facility is Sedona! 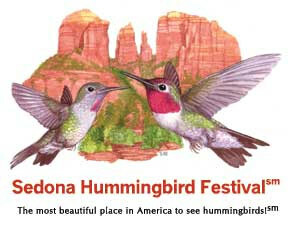 For more information visit the Sedona Hummingbird Festival website. 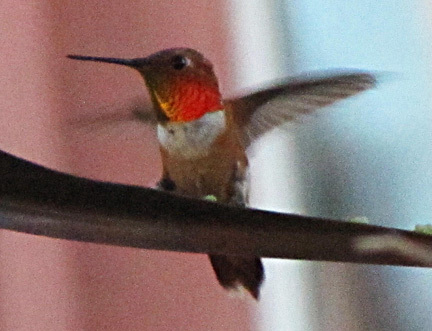 Watch all the hummingbirds chirping and zooming. 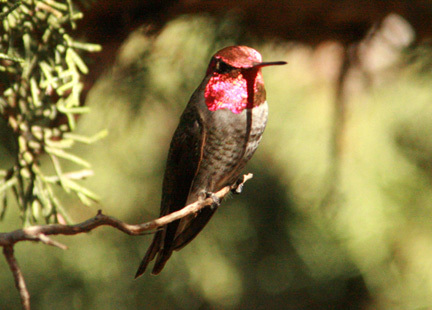 We always have at least 20 hummingbirds coming to our feeders during the winter months, (November through March). Then, at the end of June, all the magic starts to happen. Our out of town guests with wings start to arrive. There is a very steady increase in numbers until we hit our maximum around the beginning or middle of August. This year there were at least 1,600 hummingbirds visiting our 8 feeders in a 24-hour period. It is hard to imagine what this is like. Anna’s Hummingbird Anna’s hummingbirds are year-round residents of Sedona. 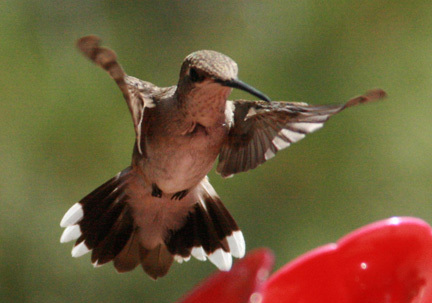 The number of hummingbirds at the feeders is determined by taking the number of ounces, 4:1 nectar mix, ingested over an exact 24 hour period, times five. The head of the Hummingbird Society, Ross Hawkins, videotaped our five species, so he could include it with some others on YouTube. See the video below. Our trees are alive with the sound of chirping and wings beating as fast as 300 beats per second. The action starts about 25 seconds into the video. 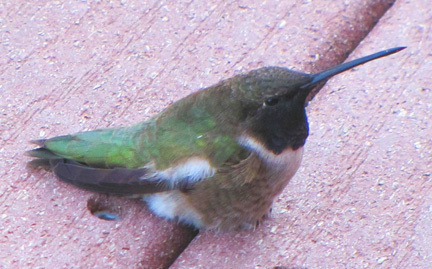 Rufous Hummingbird Rufous hummingbirds migrate in Sedona all summer long. Come and stay with us any time of year and have a special experience by patiently waiting by the feeder until they sit on your finger. People have said it is more than a special experience to feel their little bitty feet on your finger. It is a Spiritual Experience and a communication with nature like they have never felt before. Hummingbird on finger These are my babies! In case you were wondering, we treat our two-legged visitors just as special as our winged ones. We are anxious to meet you and share this adventure with you. 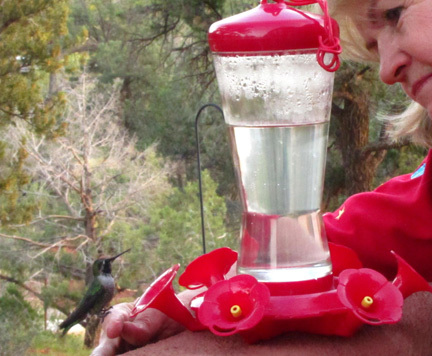 In the summer months we have had 1,600 hummingbirds at the feeders every 24 hour period. Our trees are alive with hummers. 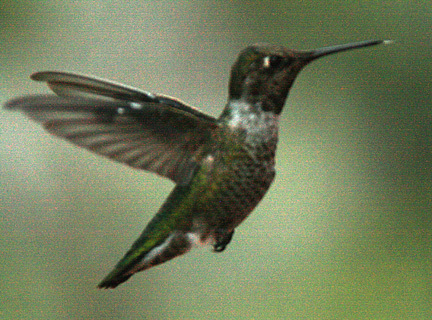 These are the hummingbirds we are blessed to see: Anna’s, Rufous, Black-chinned, Broad-tailed, Costa’s, Calliope. Different ones arrive at various times starting with April 1st. If you come in July and August and the first half of September, you will see all of the ones mentioned here. In 2011 some began to leave for Mexico around September 15th. Then throughout the end of the month, they slowly started to leave. During October, we still have around 200. They are mostly Anna’s (the ones with the fuchsia or deep pink neck and face). However, this year we still have some Rufous and Black-Chinned. Perhaps they were too young to make the long trip or they just didn’t get the memo. We will keep the Anna’s all year long. 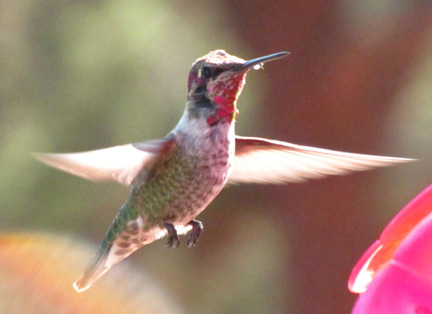 Anna’s hummingbird –Since we are a very private Sedona Bed and Breakfast, we can only allow our guests to experience them. Many have been patient and had them lite on their finger while sipping the nectar from the feeder. You can see one doing that in one of our pictures. Several guests have said it is a spiritual experience to see them that close and have them look up at you while feeding from your finger. Black-chinned Hummingbird A Black-chinned hummingbird, either an adult female or immature of either gender. 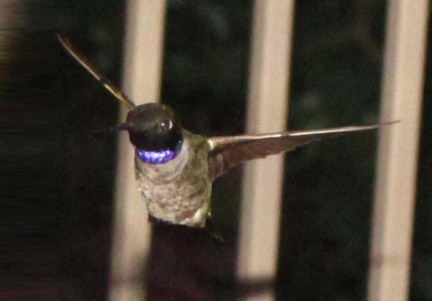 The mark on the chest is a “war injury” where it has been poked aggressively by another hummer. Native American legend says the first two hummingbirds were created from the small feather scraps left over from the construction of other birds. The Maker was so pleased that he made them with bold colors that glowed brightly when the sun shined upon them and became drab when they looked away from the sun. Some also believed that the hummingbird is the sun courting a beautiful woman, the moon. Whatever you believe and regardless of whatever is true, the hummingbird is a magnificent creation with aviary skills that defy the imagination. They can fly side to side, pivit, tilt, hover, fly backward and forward and when desired – upside down. 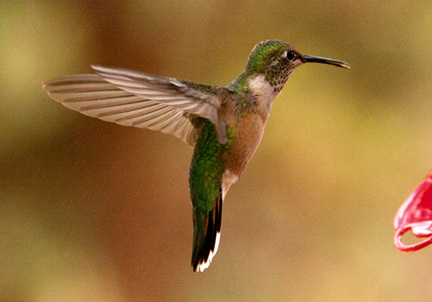 There are over 300 species of hummingbirds located only in the Western Hemisphere. 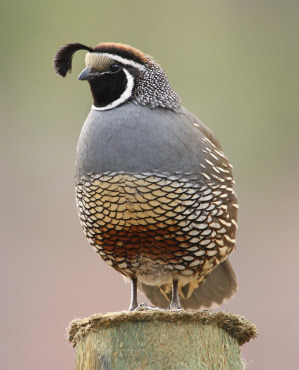 Most of them stay in South and Central America, but a few migrate annually to North America and use their built-in GPS to return to locations where there is food supplies they have found before. In parts of the U.S., some species stay and do not leave the country. They are tiny, curious, territorial, friendly, aerial gymnasts whose wings flap faster than the human eye can record. They dart from feeder to branch and as they zip along you will take notice of the distinct whirring, humming wound from the beating of their wings. Then while resting on a branch you can hear them exchange messages to each other with their constant chirping and chattering. Males are prone to take long 20-foot dives to impress the females and sometimes fly in horizontal figure eights, called shuttles in an effort to make the required good impression. It is also not unusual to see a pair of hummingbirds fly in a spiral fashion face to face swirling high toward the sky – up to twenty feet. When dusk arrives they finish feeding and suddenly are gone as if they had magically vanished into another dimension where they will stay until dawn occurs and it is feeding time again. That’s when these avian jewels are ready to perform again. Steal your heart without trying. They come in summer, leave in fall. But joy for all at the summer show. These birds were identified by a bird watching group. They were either seen on our property or over at Red Rock Crossing, five-minutes away. The Sharp shinned hawk comes by on occasion also.